Borderlands 2 is kicking off a new year with its third DLC release, “Sir Hammerlock’s Big Game Hunt.” We’re taken to a new continent called Aegrus that’s a little more like the swamps of Dagobah than the deserts of Tatooine. No lost pirate treasure or Ultimate Badass competition this time around, just some bonding with “naturalist” Sir Hammerlock through the hunting (and killing) of the indigenous wildlife. Leave it to some crazy professor once employed by Hyperion to spoil the fun. As with the previous two pieces of DLC, you’ll pretty much get the picture of what you’re in for from the intro movie: hunting, a freaky cult, and plenty of face-to-mustache time with Hammerlock himself. I want to say there’s more; in fact, there’s nothing I’d love more than to add onto that previous sentence, “... but wait! That's not all!.” Sadly, I can’t. 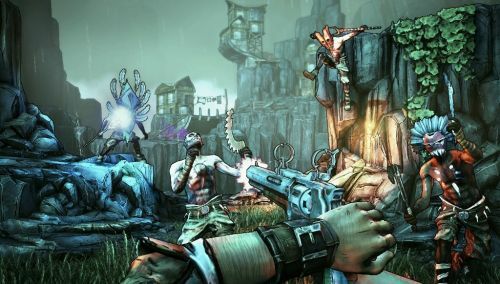 “Sir Hammerlock’s Big Game Hunt” is fun, a great time with buddies, yet it’s also lacking something that’s needed at this stage in Borderlands 2’s gaming life: a renewed feeling of being a badass. Let’s take a look at the setup this time around. Hammerlock invites the Vault Hunters to the, as yet, unexplored continent of Aegrus with the promise of hunting big (and new) game. Once you arrive and start in on the hunting and camaraderie-forming proper, the festivities are broken up by Professor Nakayama, a new character who serves as both the main nemesis and comedic foil for the story missions. Without spoiling anything, Nakayama has some plans that involve a recently deceased foe, genetics, and a Hyperion ship that has somehow crashed onto this continent. He’s a fun/outrageous character in an ever-growing cast of such personalities, and it’s an interesting little (emphasis on “little” as there are around 5 brief story missions) jaunt through a new Borderlands tale. Speaking of new foes, the new enemies introduced in the DLC definitely feel different than those presented in the previous two installments, at least as far as the humanoid opponents go. The scaylion, borok, marsh strider, and giant spore are the latest creatures to get added to Borderlands’ bestiary, though hardly any of them present a significant challenge. The giant spores are really more annoying than anything else as they can cause your Vault Hunter some pain/grievance in their death throes by tossing out elemental spores that can't be shot down and seek you out for a little bit. Perhaps the greatest threat to players comes from the cult of worshippers that inhabit the land. A new enemy type, the witch doctor, is not only capable of restoring his life by taking yours, but he can also increase the level of nearby enemies, making them stronger and harder to kill. Andrew and I both adopted an approach of “see, charge, kill” when we first encountered them and that lead to quite a few deaths. These guys are best handled at a distance, so their life draining abilities can’t reach you, and quickly before they can level up too many of their allies. Finally, there’s a new raid boss in town. In the middle of December, a patch was released that limited the overall viability of the whole Conference Call shotgun/Bee shield combo. PC players have been dealing with this for some time, but it was a new detour, so to speak, for Xbox and PS3 players. No more soloing Terramorphous or even downing newer bosses like Pyro Pete with just a couple others. Strategy and teamwork is now required to effectively deal with these foes, and the new raid boss is no exception. Without spoiling too much, let me just say this: it is the final nail in the coffin of everyone’s favorite damage-dealing combo. So, if there’s plenty of new things to see in “Sir Hammerlock’s Big Game Hunt,” good new characters, and some fun hunting side missions, what’s the problem? I go back to my earlier sentiment that while new is good, feeling like a badass is better. One thing for which I credit Gearbox greatly is that the original Borderlands managed to keep going strong amidst a constantly shifting sea of new releases thanks to its DLC. Much of that had to do with the third piece of DLC in particular: the “Secret Armory of General Knox.” That add-on not only had a few new enemies and characters, but also a new encounter altogether (Crawmerax the Invincible was the first ever raid boss) and a new level cap. “Sir Hammerlock’s Big Game Hunt” is almost all of that, but lacks that quintessential last piece: the raised level cap. Part of the joy of playing any loot-grinding game is not only getting that one piece of gear that makes you laugh at all who stand before you, but also earning those XP points that take you to the next level and the skills that await you there. All of the XP bonuses in this DLC are wasted on level 50 characters, of which most players should have at least one by now, and mid to high level 40 characters are likely better served by advancing through the other DLC. At this point in Borderlands 2’s lifecycle, it’s hitting its wall; particularly since the patch. It needs some added way to help you feel like you’re getting even better than before to really keep it going. 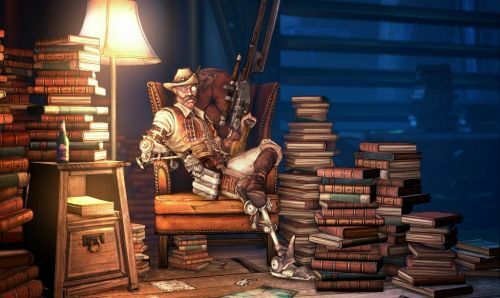 If you’re a fan of Borderlands 2, then you’ve likely already picked up the Season Pass or set aside the money for “Sir Hammerlock’s Big Game Hunt,” and you likely won’t be disappointed. It is a fun add-on piece with some interesting new places to explore and things to kill. However, if you weren’t overly impressed with the prior two offerings, then perhaps you should wait until we see what Gearbox has in store for the last piece of DLC before hanging with the mustachioed naturalist. Page created in 0.2985 seconds.